The Pumpkin King steals your girlfriend, Jennifer, from the graveyard where you have, evidently, just been brought back to life. Note 1: Like platforming/action games? Check out my reviews of Kid Dracula, I’m Kid Dracula, Super Back to the Future, Part II, and Doki Doki Panic! Note 2: This game was played on a NES 101 console. The NES 101 was modified to output in AV (red, yellow, white), and was connected to a 32-inch HD tv. Quick History: Splatterhouse: Wanpaku Graffiti was released in Japan in 1989 for the Famicom (Japanese NES). It is a sequel/re-make/parody of the original arcade game, Splatterhouse. 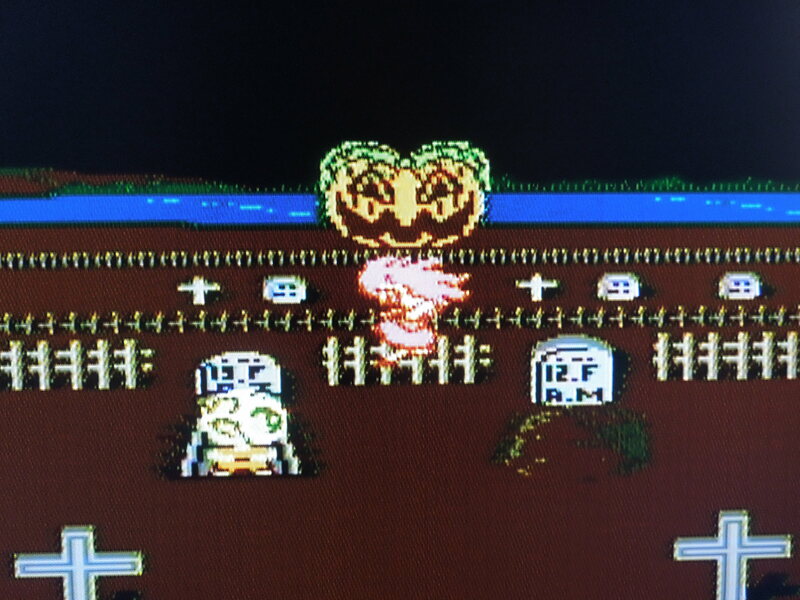 It uses a super-deformed art style on its characters, and unlike the original horror-themed arcade Splatterhouse, Splatterhouse: Wanpaku Graffiti took a hybrid horror/comedy approach, and often parodies 1980’s horror movies. 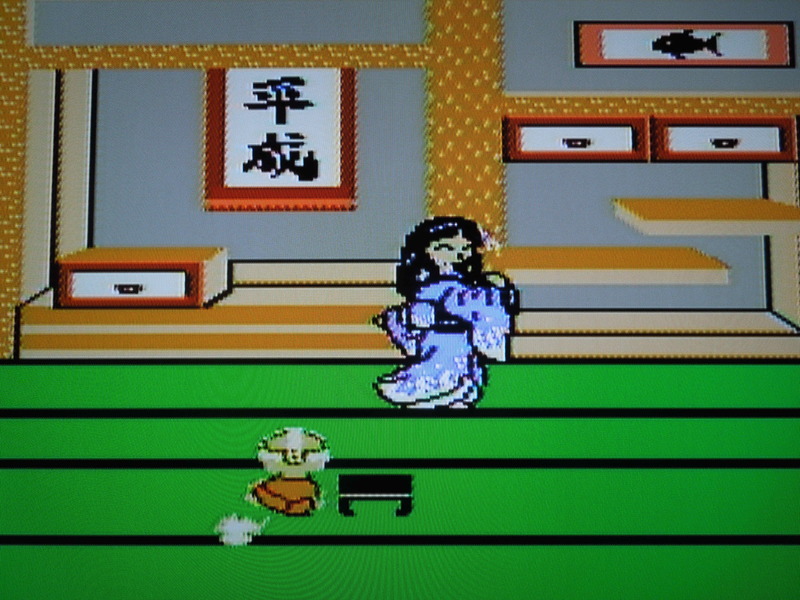 Perhaps one reason the game never received a U.S. translation and release was because of the game’s numerous depictions of religious iconography – something Nintendo of America had a strict policy against. 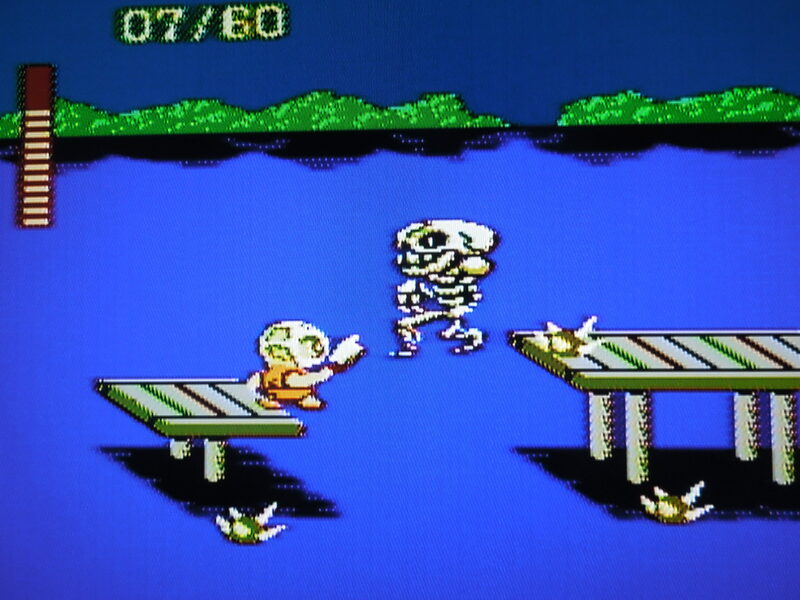 Additionally, the game had many references to American horror movies, and perhaps there was a fear that copyright infringement might have been an issue in the U.S. Today, however, Splatterhouse: Wanpaku Graffiti has been translated and placed on to reproduction cartridges for play on NES consoles. 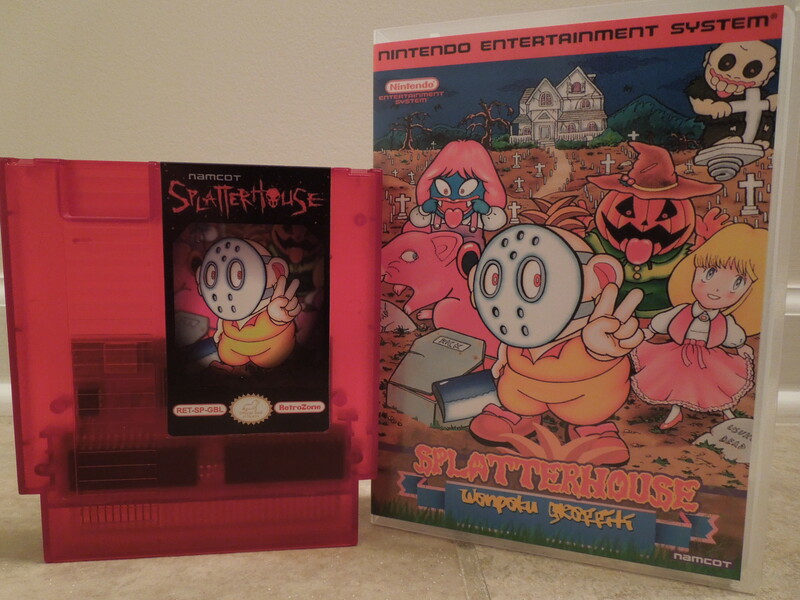 With these reproductions, often the title is shortened to simply ‘Splatterhouse.’ This review is for the NES reproduction cartridge, Splatterhouse. This just might be the game’s toughest boss – a giant rat that you must cut in half. Story: You play the game as Rick (who bears a striking resemble to Jason Voorhees from the Friday the 13th movie franchise). You start the game, evidently, dead, or at least, buried in a coffin in a graveyard. Your girlfriend, Jennifer, weeps over your grave until lightning strikes, bursting open your coffin and bringing you back to life. Jennifer rejoices, but your reunion is short-lived, because the Pumpkin King swoops in and steals Jennifer, and you must rescue her. The mask you wear is the ‘Terror Mask,’ and it is the source of your power. 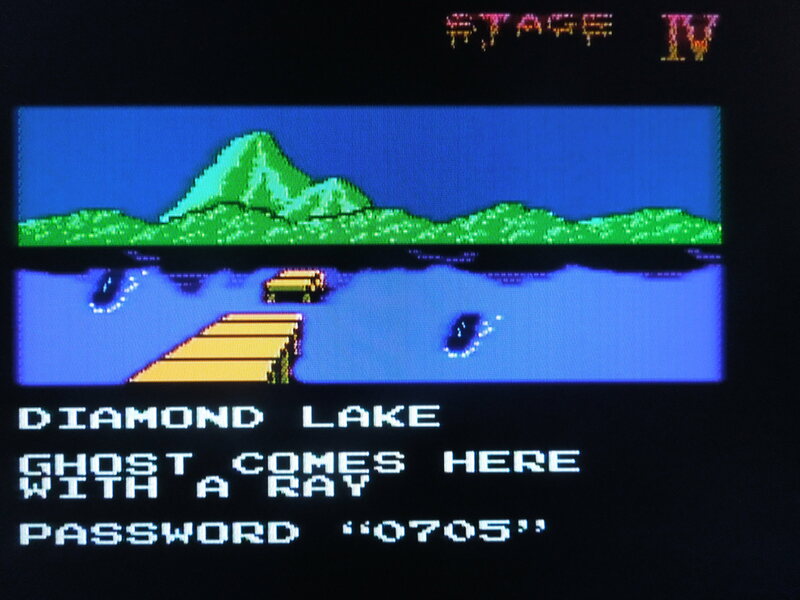 7 Stages of ‘horror’ await in Splatterhouse, most which start with a confusing message, like the one seen here for Stage 4. 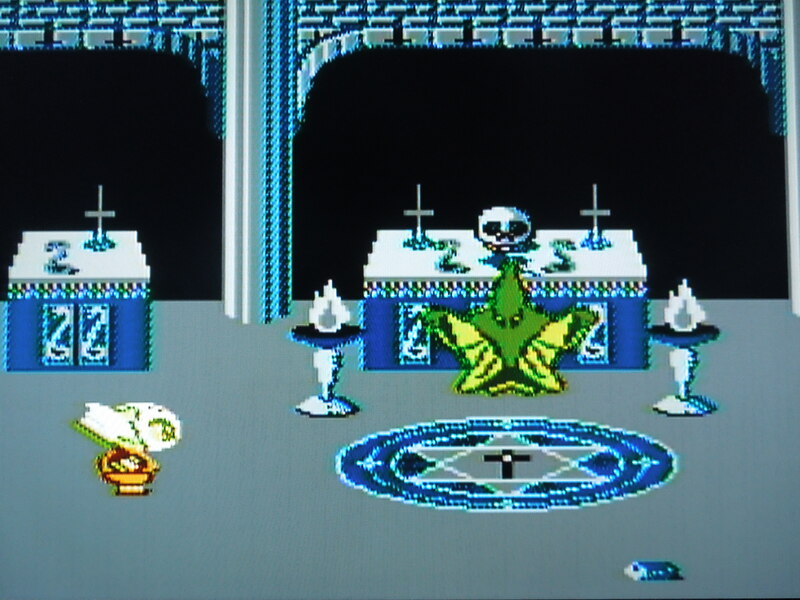 Nintendo of America never would have allowed these religious symbols in one of their games back in 1989. Nintendo of Japan was not as rigid. Gameplay: You battle through 7 stages of Platforming/Beat ‘Em Up action, battling all sorts of evil creatures. You’ll traverse a graveyard, a sewer, a church, a haunted campsite, a mountain, and a mansion on your quest to destroy the Pumpkin King and rescue Jennifer. As you fight your way through the levels, Rick can ‘level up’ as he defeats enemies. You start the game with only 4 energy bars, but after killing a certain number of enemies, you’ll gain a level and your energy bar will get longer. Level 6 is the maximum number of levels you can reach. Control: B swings your axe, which you carry at all times, unless you find a shotgun. A jumps. You can jump and swing your axe in mid-air to defeat enemies. When you find a shotgun, press B to fire, but you only have 10 shots. Enemies often explode into pieces or splatter against a wall when you chop them with your axe or blast them with the shotgun. Very satisfying. Music and Sound: Slightly above average music. Each of the 7 stages has a ‘creepy’ theme that helps add to the ‘horror’ atmosphere. The sound effects work, but are nothing special. Password: At the beginning of each level, you’ll receive a 4-digit password. This is great for not having to beat the whole game in one setting, but remember that you’ll start the game on the lowest energy level (Level 1 – four bars of energy) when you start by using the password. If you play from the beginning all the way through the end of the game, you’ll have an extremely long energy bar by the end because you’ll have killed so many enemies and gained multiple levels. Therefore, a full playthrough is the most recommended method of beating the game. You do get continues, by the way – 4 to be precise. There are checkpoints that you reach within the 7 levels, so you won’t necessarily have to continue from the beginning of a level if you’ve reached a certain point. 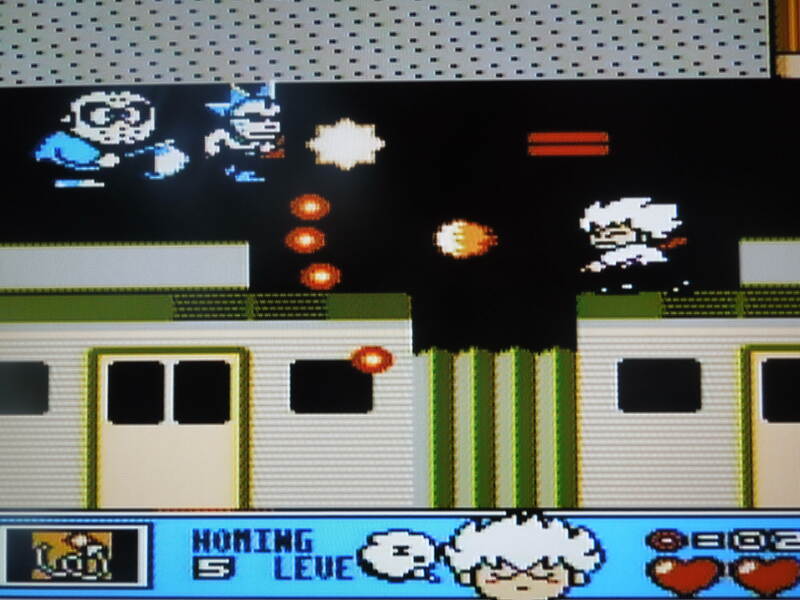 There are two hidden stages to find in the game. The women there each give you a pearl that will unlock an extra ‘ending’ scene when you beat the game. So, where can I find this game? You can buy the Famicom cartridge from Japan, and if you have a Famicom-to-NES adapter, you can play it on your NES, or you can google ‘NES reproductions’ and find a website that sells the translated NES reproduction cartridge. You can download the rom for play on a computer emulator as well. Conclusion: Splatterhouse for the NES is quite a fun game. There weren’t a lot of great horror-themed games for the NES, and the fact that this one parodies 1980’s horror movies is a nice touch. It’s difficulty is average. While the game isn’t very long, it may take a little while to defeat some of the game’s 7 bosses – it will take a few tries before you learn their patterns. The game is somewhat of a novelty, and replay value isn’t terribly high, but you’ll be entertained while you do play, at least. 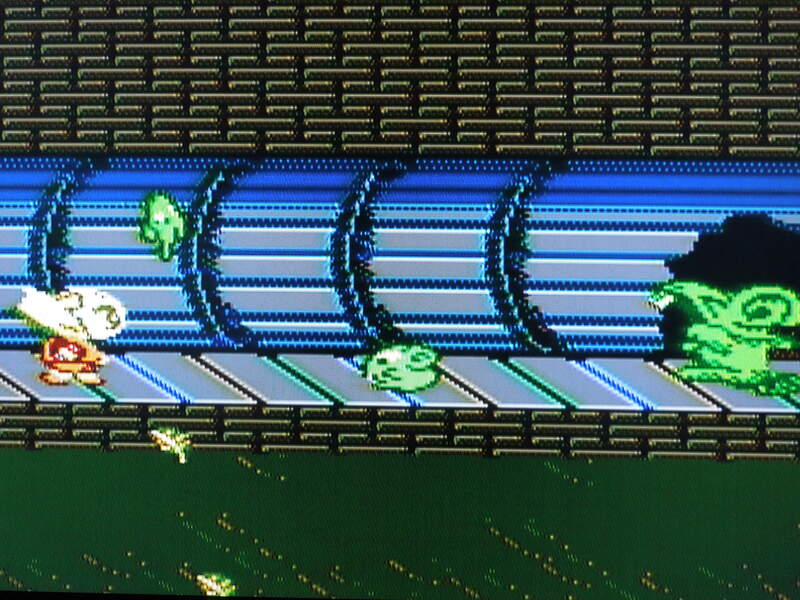 Comedy & Horror make for a fine mix on the NES.